We are an independently owned travel agent, established as a professional, service oriented and cost effective travel company. Ever since our existence, the company has built a reputation for providing a comprehensive Visa service for our guests with a high standard of personal touch. In today’s corporate travel world, we recognize the importance of speed, efficiency and cost. The success of our growth has been due to our commitment at providing the best possible prices, whilst maintaining complete customer satisfaction. What began as a hobby has turned into one of the most sought after professional services in town. Feel India was established in 2001 in Indore with a firm intention of offering hassle free Holiday. Feel India grew rapidly by personal recommendation as a firm, which undertook attentive and responsible checking before any application was attempted to be lodged. Feel India took pride in the almost 100% success rate of acceptance of applications and continues to enjoy first time acceptance percentages in the high nineties. Time was, and still is, budgeted for, in order to allow for the careful checking of applications before submission. In addition, an excellent office procedure system, which continues to this day, motivates our office processing and our field staffs to cross checks each other and further encourage competence and efficiency. This manual system is still used, because it works. Feel India quickly gained an enviable reputation for customer service of the highest standard and for attention to detail in all its dealings. 2. Valid passport with at-least six months remaining before expiry from the date of arrival in Singapore. 7. If a single parent is travelling with minor kid, then the original NOC of the other parent, along with his/her signature and name proof should be accompanied without which visa will not be granted. 9. Ensure that passport has at least 2 blank pages. VOA : visa on arrival (VOA) facility is available for Indian nationals, provided they have a valid visa andare travelling to either Singapore or Thailand. This VOA is only for a stay of maximum of 7 days in Malaysia. The visa fee payable at the Malaysian airport is USD 100 per person and they must show they have at-least USD 1000 cash on them to cover their cost of stay there. Further, this facility is only for pax travelling by air into Malaysia. 5. If first entry as per the tickets is in Singapore , then the visa copy of Singapore should be attached at the time of application, without which visa will not be granted. 6. Original covering letter on letter head is a must for all cases. 7. 3 months latest bank statement certified by the bank with Minimum Rs. 30000/- (Individual) closing balance and Rs. 60000/- (Family) balance must have in account. If wife’s passport is on the maiden name and there is no marriage certifcate then wife bank statement as per the above clause is also required. 8. If there is no bank statement or if the balance in the bank is not as per the above criteria, then Hotel Reservation (Bookings.com will not be accepted) Confirmation should be submitted. This confirmation should have the booking reference number, name of all the pax, name and designation of the authorised signatory and hotel address and phone numbers on it. 9. If a person has not travelled before anywhere (i.e. blank passport), then Original bank statement with bank stamp and sign AND MINIMUM CLOSING BALANCE OF RS. 50000/- PER PERSON is a must. If wife’s passport is on the maiden name and there is no marriage certifcate then wife bank statement as per the above clause is also required.The same applies to person travelling with family (in case of blank passport). If retired, covering letter on plain paper and bank statement is must. If husband has travelled before but not his wife, then also bank statement is compulsory. If husband or wife has travelled before but not their child, then bank statement of the head of the family is required.This is only if the child (male or female) is more than 18years. 3. Address proof in the Companies letter head (Original) if the Company has provided accommodation. 2. Covering letter ( on letterhead) with name and designation/ profession of the person travelling and that of the person signing on it. 3. NOC from the company in case pax is working somewhere. 7. Original purchase receipt of Foreign exchange of USD 700 per person and USD 1400 Per family ( for 1 couple with 2 children less than 10 years) if children are more than 10 years then USD 700 per person OR International Credit card copy, front & back. If pax has bank closing balance of more than INR 50000 per person, then forex receipt or credit card is not required.But bank statement / Passbook has to be in Original with the bank seal near the closing balance. 8. Proof of Hotel accomodation with all passengers name clearly mentioned on it. Thailand’s Ministry for Foreign Affairs (MFA) has LAUNCHED a new six-month multiple-entry tourist visa (METV) on November 13, 2015. The visa, costing INR 10,000 (5,000 baht) will grant travelers multiple entries during a 6-month period, for up to 60 days per entry. Indian travelers must be able to show a proof of funds in excess of INR 400,000, 12-months’ validity on their passports and must display an intention to travel to Thailand at least twice during the six-month period in order to be eligible for the METV. One can only apply for an METV at a Royal Thai Consulate. It is not available on-arrival. * To be Applied Online. An ETA is a visa for travel to Sri Lanka for a stay of up to 30 days. The Sri Lanka ETA is issued on-line; it is not necessary to submit an original passport or other documents for processing. Simply send your passport copy and the Sri Lanka ETA can be processed within 48 hours. Sri Lanka ETA requests are processed Monday to Friday during business hours. 4. Covering letter on business/ professional letterhead addressed to the Consulate General Peoples Republic of China, explaining the reason of travel with name & designation of the signatory and with company’s original seal/stamp. 6. Hotel confirmation voucher directly from China. 4. If you have a sponsor, a letter from your sponsor stating your relationship and the reason of sponsorship and EVIDENCE OF HIS/HER RESIDENCE STATUS IN AUSTRALIA along with the latest bank statement from Australia is a must. 7. Salary Certificate, copies of fixed deposits and investments etc. 9. Parents visiting children who are living in Australia as a PR or Australian Citizens need to undergo medical examination under panel doctor if they wish to stay in Australia for more than 12months at a stretch. 1. Passport valid for 3 months from the date of travel. 2. 1 Form, which can be used by a single applicant or a family which includes the single applicant, spouse and dependent children under 20 years of age. 4. Covering letter explaining the reason of travel with name & designation of the signatory. 5. Proof of income i.e. last 3 years I-T Challan or TDS Certificate, either of one, but duly Notarized. 6. Latest bank statement in Original. In case of photocopy, the same has to be Notorized. 5. Air tickets or Itinerary print out. 7. Covering letter explaining the reason of travel with name & designation of the signatory and also the person who is travelling. 11. If pax going to attend any Exhibition in Germany, then the original exhibition ticket or the invitation fax by any exhibitor in Germany is required, without which visa will not be granted. 11. Salary Certificate for last 3 months. paid in advance and the balance amount remaining should Necessarily be mentioned on it. 6. Covering letter addressed to the Embassy of Switzerland, New Delhi, explaining the reason of travel with name & designation of the signatory. We also require the contact details of all the pax more than 12 years of age, even if it is one family. 9. Salary Certificate for last 6 months mandatory for salaried individuals. 11. In case of Honeymoon couples Original wedding card along with the above documents. pages of current passport must be submitted. 4. Notorized Marriage Certificate in case of couples (Irrespective of their age); Mandatory for all. 5. Student Bonafide certificate or I-D Card copy. In case of minor below 18years, the application form must be signed by both the parents. Photocopies of passport of both the parents, attested by Notary Public, must be attached. A No Objection affidavit should also be submitted along with all the other listed documents. 6. Hotel confirmation voucher for the entire duration of stay (for all the cities pax is going to visit in Schengen states) and travel itinerary for the entire duration of stay. joining of the pax and his designation, total salary drawn should also be written on the covering letter (this should tally with pax salary slip). Pax Courier address (where VFS will send the passport after visa is issued )should be mentioned on the covering letter. 14. Photocopy of the applicants passports, present and previous (all the pages). available, then photo copy of all the pages of that old passport need to be enclosed with the application. 16. In case of old passport which is lost, a copy of FIR to be submitted along with the case. 2) Attested copy of the passport and the DNI or residence card of the person living in Spain. 2. Application form completely filled and signed by the applicant. 6. Itinerary of the trip. 8. Overseas travel medical insurance valid for all Schengen-countries .The insurance has to cover the applicant for at least 30,000 Euros or equivalent, for all risks e.g. accident, illness, medical emergency evacuation etc. The policy has to clearly specify the period of validity and has to cover the entire duration of the trip including the date of arrival and departure. 12. Photocopy of the Passport Bio Page and Last Page. The application will not be accepted if any of these documents is missing. These documents must be provided in the above mentioned order. 5. Proof of accommodation i.e. hotel reservation directly from a hotel in Austria. 7. Covering letter in details highlighting the reason of travel, Proof of your current occupation, A no objection letter from your company stating your leave. 8. Proof of Sufficient funds means for your stay (recent (3 month) bank statement with the telephone number of the bank clearly visible. In case of a minor traveling alone a no objection letter from both the parents attested by a notary. In case of a minor traveling with one of the parent, a no objection letter from the other spouse attested by a notary is to be provided. 4. Day to Day itinerary in detail for the entire duration of stay in Korea. 5. Covering letter explaining the reason of travel with name & designation of the passenger and name, designation and mobile number of the Signatory, passengers mobile number, date of birth and passport number and the Seal of the company. 7. Bank statement, personal and company’s for last 3 months, duly attested by respective bank with original bank seal with banks telephone number on it. 3. Kindly specify in detail the Designation e.g. “General Manager – Sales, Vice President and Lecturer etc” in the application form. 4. Kindly specify in detail the Occupation been served, whether “Business or Self Employed” in the application form. 5. One Photo of size 4.3 x 5.5 cms colored and clear with 80% of the face clearly visible. 6. 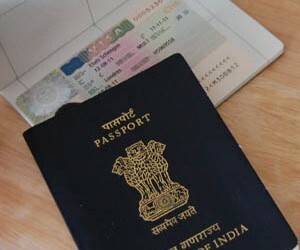 Pages exhibiting the evidence of travel and visa in current and old passport photocopies of the traveled and valid visa pages.